Haren is going to be Belgium’s largest prison and will be operational in a few years. 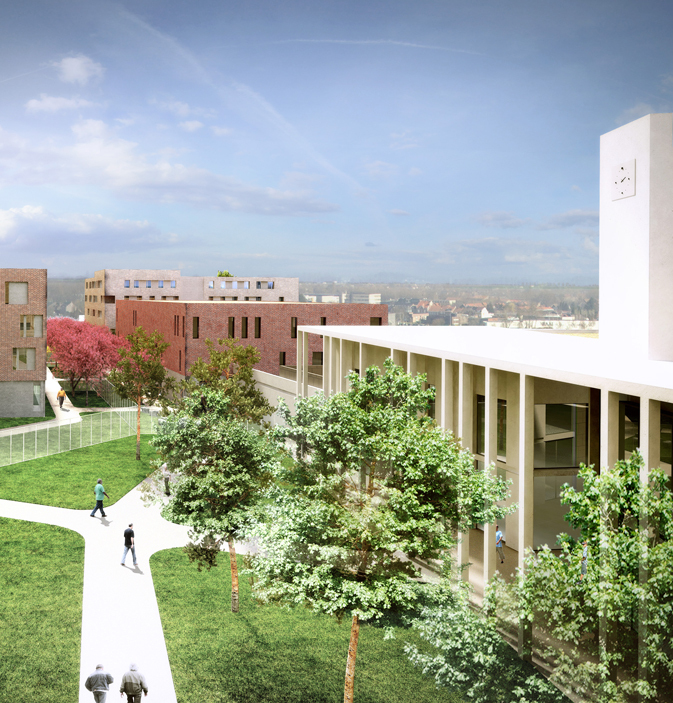 The complex will comprise eight buildings, including three male prisons, two female prisons, a forensic psychiatric centre, a youth institution and a general building. The complex will house a total of 1190 prisoners. Besides accommodating detainees the prison complex will provide space for a court of law, a sports complex, a work complex, visitor rooms, an office for security staff and a hospital. The complex will cover 106.137,26 m² in total. The Cafasso consortium took the view that detention must always lean towards normalisation, rehabilitation and integration, in each instance in combination with the required security conditions. One of the difficult aspects of this project was to incorporate a detention policy in an efficient yet humane complex that meets contemporary needs and is also adaptable to future evolutions within the prison service. The underlying objective is not just punishment, but also the care in preparing inmates for their return to mainstream society. In various ways the model makes allowance for various aspects of a ‘normal’ life, i.e. working, living, social life and family life. The urban planning manifestation of the master plan and the architectural manifestation of the buildings play a central role in this approach. The design gets away from the panoptic T-shaped model and star-shaped building and instead provides for smaller building volumes. The scale of the buildings is a reference to a ‘normal’ situation, with the communal building skin to a town hall or administrative centre and the cluster buildings to multiple family dwellings. The model is based on living units comprising between 25 to 30 cells, grouped in clusters and in entities. The Cafasso consortium devised a modernised cluster structure in which every corridor houses only eight cells so as to create far greater privacy. 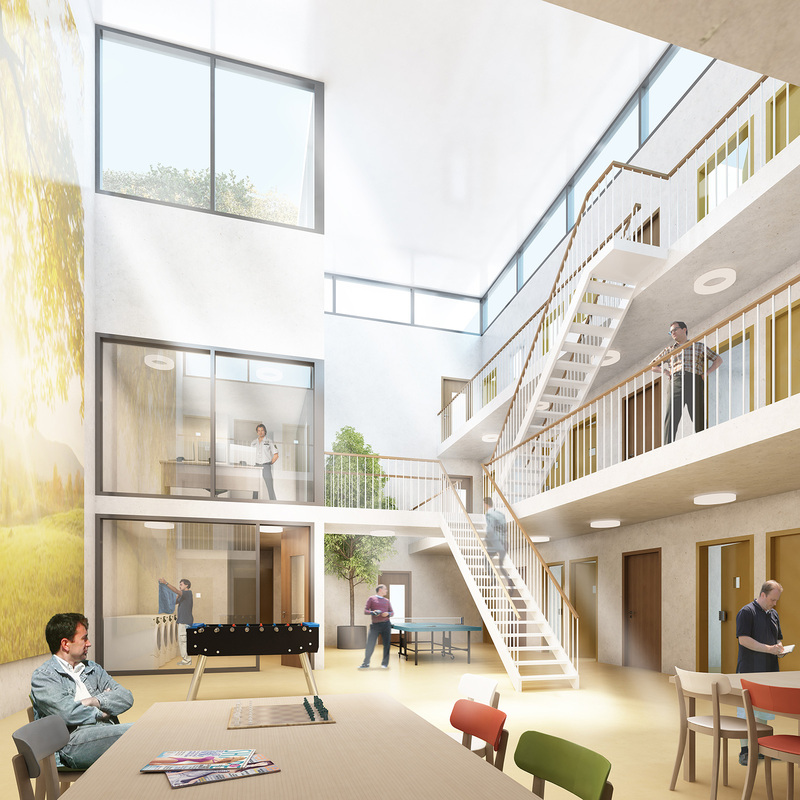 The ‘town hall’ brings together several elements of the programme: sitting rooms, security control room, reception complex, national transfers, sports hall, front office and rooms for visitors. It is a building where external visitors and prisoners can meet each other. For that reason the building has been given two faces. Above the logistical services a sports field will be integrated in the green roof, providing unrestricted views of the surroundings and creating a sense of freedom. There is a significant height difference on the site. The design leverages the height difference to create views, connections and variety. By opting for an intelligent scale and configuration of the buildings, it is possible to create views to and from the surrounding area. The most important visual and functional axis refers to the route of the road called Keelbeekweg. The complex will be accessible from Woluwelaan by means of a new access road. The entire complex reflects a village community. This has been translated into a ‘village’ arranged around a green ‘village square’ that doubles as a central public area. By creatively incorporating into the design the height differences in the area, the prisoners as well as the local residents get a varied view. The prison wall has been designed in the most natural way possible. The decision to use bricks allows variation in the different building volumes and refers to the types of buildings in the local area. Within the walls bricks will be combined with concrete to give expression to the more communal functions in the plinth of the buildings. Natural green, a village-like setting and recognizable materials thus contribute to the humane conditions of the prison. 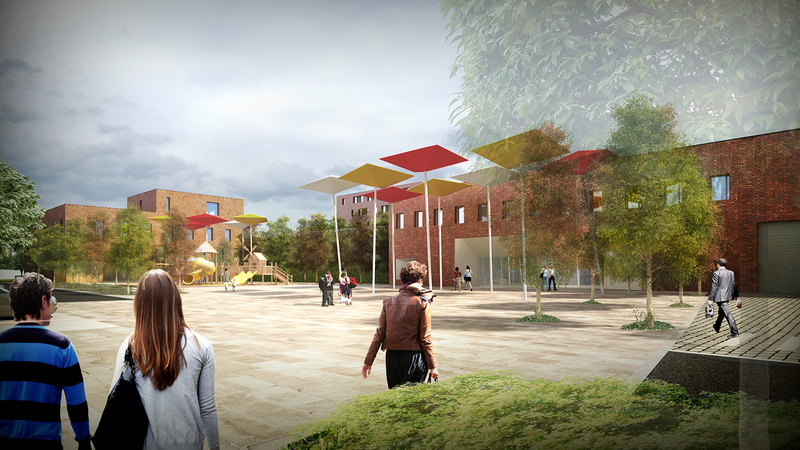 A public square will be created around the entrance building: the ‘Inkomplein’. The second square, the ‘Campusplein’, is the central square within the walls and connects all buildings. 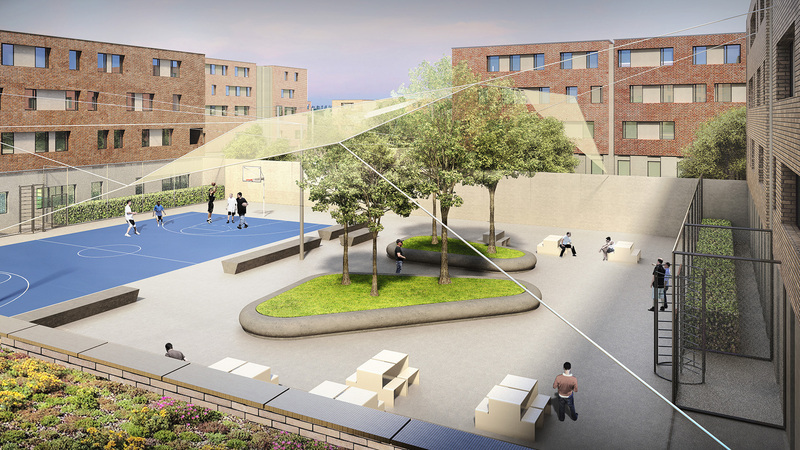 This square is the link between living, working and relaxing within the prison environment. In addition, an attempt has been made to permeate the human character of the complex with the concept of the prison wall. Without detracting from the security requirements and without denying the reality of a prison, the impact is humanized by possibilities of overlook. The relief is used to create transparency, connections and variety. The design is based on a sustainable project in the broadest possible sense of the word: responsible use of space, integration into the environment, social implications, flexibility, ecological and energetic aspects, maintenance of materials. In common areas, accent colours and wood are deliberately used, materials that have a positive influence on the mood of the users. The use of colour within the cells is deliberately kept neutral.